Secure a Galaxy Tab 3 10.1 tablet with elegance and class. 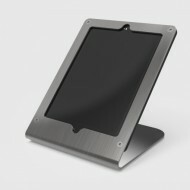 Great for point-of-sale, loyalty systems, facilities automation and so much more. SKU: N/A. 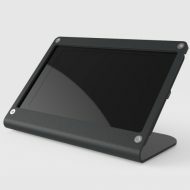 Category: Tablet Stands. Quickly tether your Tab 3 with a ClickSafe cable lock (sold separately). The lock’s mounting point is discretely located around back. 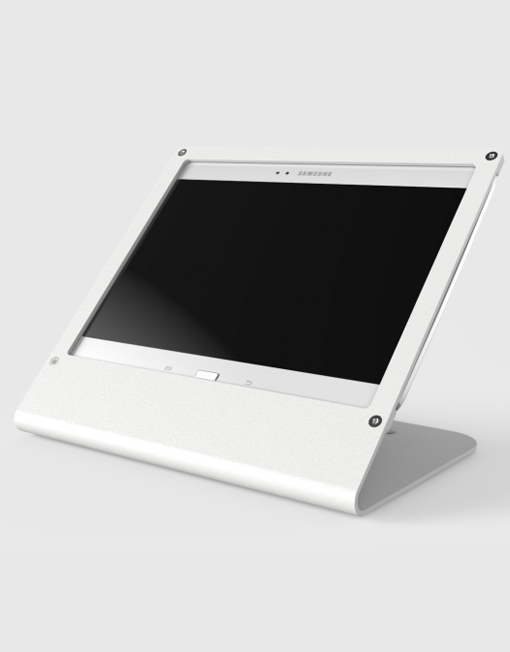 The stand ships with PivotTable give you the option for pivoting and Pivot & Slide installation. Are you willing to drill a half inch diameter hole in your countertop? If so, check out PivotTack (sold separately). 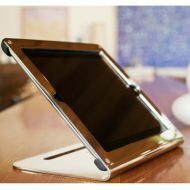 Unlike other secure tablet stands, WindFall Stand for Galaxy Tab 3 10.1 does not cover and block important ports, sensors, antennas, cameras and buttons. 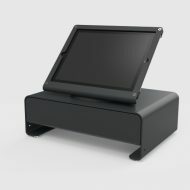 This stand even maintains enough clearance beneath the tablet for the power cord. 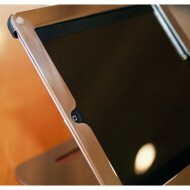 WindFall Stand for Galaxy Tab 3 10.1 utilizes our patented “E-style” bracket design. 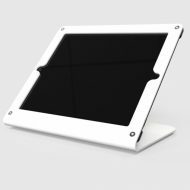 This ingenious design locks the tablet in place with two carefully designed, laser-cut, precisely shaped heavy steel brackets. This stand is not a toy. This stand is built commercial-grade. 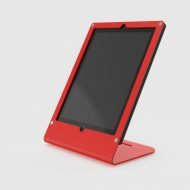 Thick steel, stainless steel hardware, and a custom-developed, fine texture powdercoat finish help ensure you WindFall Stand will endure years of consistent use and abuse. 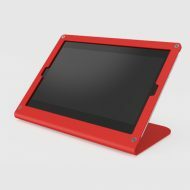 WindFall Stand for Galaxy Tab 3 10.1’s screw caps provide the final touch by hiding the rear facing hardware and completing the stand’s clean aesthetic.